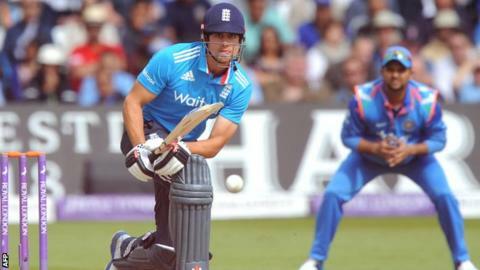 England coach Peter Moores insists skipper Alastair Cook can be an influential batsman in one-day cricket. Last week ex-England spinner Graeme Swann said Cook should not be in the one-day team as he scores too slowly. "Alastair has taken some criticism but is a very good one-day player with five hundreds and 19 fifties," Moores said. Following successive heavy defeats, England trail 2-0 in the one-day series with India and need to win at Edgbaston on Tuesday to keep the contest alive. Cook top-scored with 44 in England's modest 227 at Trent Bridge on Saturday, which India overhauled with six wickets intact and seven overs to spare. The captain has 3,030 runs from 84 ODIs at an average of 37, with a strike rate of 77 runs per 100 balls. He shared a second successive half century stand with new opening partner Alex Hales, who made 42 from 55 balls, and Moores said: "He's different to an Alex Hales who will play a different role. The key is we find the right balance of different sorts of players to be able to get where we want to." Following the dismissal of the two openers, England failed to hit a boundary between the 18th and 44 overs, and scored only 12 runs in the batting powerplay. "In the middle overs we haven't played well enough," Moores said. "You've got to score at a rate that is appropriate for the pitch you're playing on and keep wickets in hand to strike at the end of the innings. "We haven't done that and we've paid the penalty. "It's not good enough, the players know that more than anybody else." After the opening match of the series at Bristol was washed out, England lost seven wickets for 78 runs against India's spinners in a 133-run defeat at Cardiff, and it was the slow bowlers who did the damage again at Trent Bridge, claiming six wickets for 122 runs. "The players are really clear in what they want," Moores said. "They want to get in, put the Indian bowlers under pressure, get two or three guys to go through and release some of our striking batters as the game goes on. "We've got to find a way of rotating spin better and playing the middle overs better." Former England captain Michael Vaughan said after Saturday's defeat: "The sooner England accept they can't play modern-style ODI cricket the sooner they might play it a little better." Swann, who said Cook was only one of several players who should be dropped, added that England are happy "to tootle along in a two-litre diesel in a Formula 1 race", while former England opener Geoffrey Boycott wrote in his column for the Daily Telegraph that the team should accept constructive criticism. Moores insisted the England camp did not have an issue with criticism, stating: "I don't mind people having a view of what they think is the best side, that's their right as a pundit."